The SSUSI sensor contains a line scanning imaging spectrograph (SIS) covering the far ultraviolet (FUV) spectrum, and high-sensitivity, nadir-viewing photometers operating in three visible channels. The scanning imaging spectrograph has two modes of operation. The imaging mode produces horizon to horizon line scan images at five simultaneous far ultraviolet wavelengths. In the spectrograph mode, the entire far ultraviolet spectrum is downlinked at one selected look angle (normally the nadir direction). The photometers are nadir viewing, and operate only on the night side. Of the five SSUSIs constructed in the mid-1990s, four have been launched on the DMSP (Defense Meteorological Satellite Program) Block 5D3 series spacecraft, flights F16 through F19. The fifth SSUSI is to be manifested on F20. These spacecraft are in polar sun-synchronus orbits at about 840 km altitude, causing SSUSI to observe the ionosphere/thermosphere/mesosphere (ITM) and aurora at approximately the same local time in all orbits. The SIS is an f/3 Rowland circle spectrograph with consisting of three reflective optical elements: a cross-track scan mirror, a telescope mirror, and a toroidal section diffraction grating. Reflective elements offer superior throughput versus transmissive elements in the FUV spectrum. A gilloutine-type slit is employed between the telescope mirror and the grating, enabling three different settings to trade spectral resolution versus throughput. 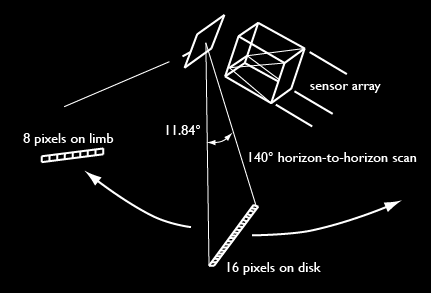 The spectrum from the diffraction grating is imaged on the detector in 16 along-track spatial pixels (on the disk; 8 on the limb) and 160 spectral bins. A pop-up mirror can be inserted to employ a secondary detector. The SIS has two operational modes: imaging (default) and spectrograph. In imaging mode, the spectral pixels are binned into five ``colors'' corresponding to photochemical reactions of interest: 121.6, 130.4, 135.6, 140-150 (LBH-S), and 165-180 (LBH-L). The color table defining which pixels contribute to the individual colors is established during the ground calibration phase, then confirmed and revised on-orbit as stellar calibrations become available. In the spectrograph mode, the scan mechanism is stopped and complete spectra in 160 spectral and 16 spatial pixels are stored once per scan period (every 22 seconds). In imaging mode, images of the ITM and aurora are built-up from brushstroke-like scans across the Earth's disk. Therefore, the different parts of a single-orbit image may be as many as 97 minutes (one orbital period) apart; although, for typical images of practical importance and interest, such as the auroral oval or the two arcs of the equatorial anomaly, the difference is closer to 15-20 minutes. The NPS consists of photometers operating at three wavelengths: the dissociative recombination of O2+ at 630.0 nm, a nearby wavelength off the emission line to correct for broadband continuum and other background signals at 629.0 nm, and a N2 emission found in the Aurora at 427.8 nm. The 629.0- and 630.0-nm filters have very narrow bandpass (0.2 nm) and calibrated temperature response so they can be tuned for maximum throughput, as well as to evaluate dark counts by tuning off the emission line under moon-down conditions. The size, weight, and power specifications for the two instrument subassemblies and the support module are listed in the table below. Because of the irregular footprint of the imaging spectrograph, the maximum footprint dimensions are listed. The maximum height of the spectrograph is listed, which occurs when the cover is open.